Please refer to our stock # 2108 when inquiring. Pair Roseville candlesticks Style #1134. 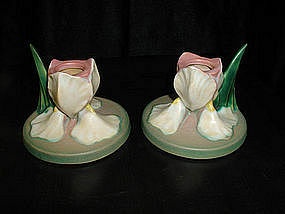 What makes these different from virtually all other Roseville pieces is that they show the iris blooms in the normal three dimentional shape, rising up from the base. The blooms are white tinged with a pinkish lavender and bits of yellow. They measure 3 1/2" tall x 4" wide and are in excellent condition.